Nestled within 25 acres of prime land in the diplomatic enclave of New Delhi, India, The Ashok hotel epitomizes heritage and grandeur, with sustainability embedded as its core value. This 550-room, five-star hotel built in the 1950s has both historical and national significance. Recently certified LEED Gold under LEED O+M for Existing Buildings, the hotel has implemented several efficiency measures to meet the certification requirements and has charted a road map to move from Gold to the LEED Platinum level. Built in an era when sustainability was an inherent construction practice, the property continues its legacy of conservation, sensitivity to the environment and respect for heritage and nature. By design, the hotel followed the lay of the land and avoided cut-and-fill. The design hugged the natural site contours. With most of the existing trees protected, the site offers an example of a landscape that is natural, protected and visually pleasing. This significantly reduces heat island impact and offers a cooler microclimate. Organic vegetables are grown on site, and a plant nursery fulfills horticultural needs. Natural and native plantings need less water for upkeep, drastically reducing outdoor water needs. On-site sewage management and reuse of treated waste water for cooling towers and landscaping has enabled the hotel achieve a zero discharge status. Rainwater is recharged back to the ground with the help of recharge pits. Water consumption has come down by 15 percent in 2016, in comparison to 2012 levels. Scoring in the Energy and Atmosphere credit category was greatly facilitated by the existing building envelope and design. Using principles of bioclimatic architecture, cavity walls, deep shading in facades, proper orientation and massing are inherent design features. This was further complemented with retrofits in energy systems to reduce energy consumption. Chiller upgrades and lighting upgrades have been carried out, and controls have been installed in guest rooms to bring down annual energy costs by a third of a million U.S. dollars. Further retrofits and installation of solar PV systems are being planned to effect overall energy savings of 35 percent by 2018. Waste management and treatment is also in place, and all the kitchen waste is treated through on-site composting. Although sustainability was embedded in the design and operating principles of The Ashok, performance tracking and documentation was initiated with the LEED certification process. LEED offered a platform to showcase the hotel’s existing and ongoing efficient operations and management. 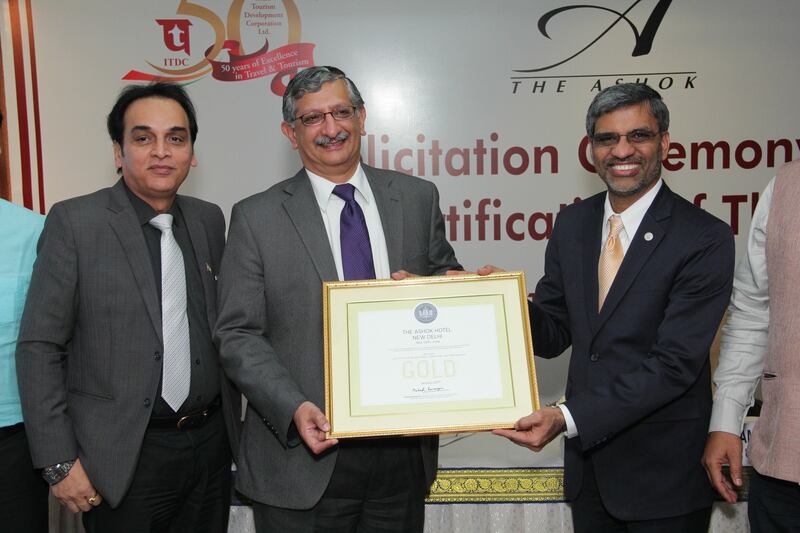 LEED Gold certification is a prominent feather in The Ashok's cap, providing credibility and global benchmarking to one of the oldest hotel properties in Asia. Payal Rastogi of Carbon Fixers also contributed to this article.